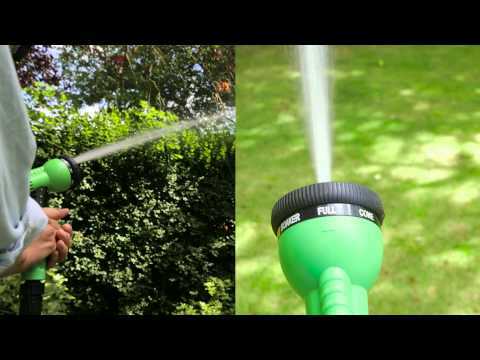 Water plants and wash cars with ease thanks to this expandable Easy Hose. The incredible kink-free Easy Hose is everything your standard garden hose isn’t - super-strong, durable and ultra-lightweight, it will expand to more than three times its length in use before automatically contracting again in a matter of seconds. The cutting-edge design eliminates virtually all the twists and tangles associated with standard garden hoses, and the universal fittings are compatible with all standard taps and hose attachments. Available in a choice of four expanded lengths to suit your garden size: 25ft, 50ft, 75ft and 100ft. The hose comes with a free eight pattern hand-held spray nozzle which allows you to choose from full, jet, vertical, shower, soaker, cone, flat and mist options. Neatly store your Easy Hose next to your tap by adding a holder for just £8.99.